"Growing old has to be beautiful"
I thought "Growing old has to be beautiful". This picture seems to wear make-up for an elderly woman to hide growing old. But that's different. 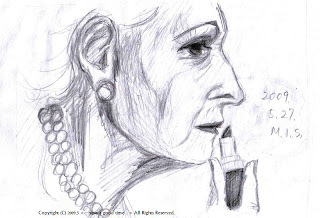 An elderly woman accepts all growing old and wears make-up on it. There are wrinkles in the skin by which an elderly woman grew old. An elderly woman accepts that. I thought that is very beautiful. I'd like to age this. Well...., today is my birthday, I thought it. Wow, I'm glad to see you. Your picture is so good, I'll follow your blog, OK? Wow,wow,wow! Thank you so much!